I thought I put my blemish prone skin behind me in my twenties but to no avail, my skin still remains incredibly stubborn during that time of the month for us girls. My pores appear even more larger around my T-zone and I find spots easily pop up - not a good look at all. So when my skin does go a bit haywire, I amp up the skin clearing treatments, in particular these 3 have helped restore a sense of calmness. I have combination skin and don't want to aggravate it with harsh scrubs so this Micro Exfoliate from Dermalogica works a treat. It has active ingredients of Papain, Salicylic Acid and Rice Enzymes to slough away dead skin cells, revealing a brighter complexion. This rice-based exfoliating powder activates upon contact with water to create a creamy paste. You shake out half a teaspoon of the white rice powder onto your wet hand and rub together, before massaging gently over your face for 1 minute then rinse off. I can feel the very fine rice powder grains polishing my skin without stripping anything away. When I rinse the product off, my skin felt squeaky clean but not drying, there is barely any scent and doesn't cause any irritation. It's gentle enough to use everyday but I use it 2-3 times a week so not to over stress my skin. This is a welcome addition when my skin freaks out. To keep my skin matt and smooth, I've been using this ARK Clearing Skin Response Serum* most nights for the last 3-4 weeks. This light weight pore refining serum claims to banish bacteria, tighten pores and eliminate shine, with antibacterial ingredients such as margosa leaf extract and nettle. Since using this serum it has calmed down my skin during any flare ups, but I'm not sure if my pores will ever be refined or tightened by any serum. I use 2-3 drops and it sinks in nicely leaving a matt base, I use this before the Kiehl's Midnight Recovery Concentrate and it's a good pairing for replenishing and keeping my skin clear. I like that it doesn't feel heavy or clog my pores but leaves an smooth texture without any greasiness. How can I not mention La Roche Posay Effaclar Duo [+] when it comes to keeping my skin clear? I've repurchased the original formula countless times, always making sure I had a back up bottle so I wouldn't run out suddenly in a skin emergency! The improved formula claims to target blemish prone skin, unclog pores, refine skin texture and controls the appearance of shine and fights appearance of marks. I love using this before my day moisturiser as it calms down redness and blemishes, and leaves skin shine free with it's light weight formula. I do feel a slight tingling when I use it over any blemishes but nothing that stings or cause irritation. I used to use this morning and night but found my skin felt a little dry so now I only use it in the mornings and that seems to be working really well. What do you use for problem skin? I hear so much about the dermalogica exfoliator, I've wanted to try it for ages! I absolutely love the Effaclar duo, it's an HG for me! I'm like you and always have a backup haha, but I'm very excited to try the + version! I hope they do too! It's the only moisturiser that I always repurchase. I'm sure you will like this new formula, this product actually delivers results and helps keep my skin clear consistently. It's a good product, not heavy or greasy at all. I love the Dermalogica line. I actually used to use this Micro Exfoliate like it was going out of style! Great products-- def looking into the Effaclar Duo! I use Dermalogica too - I think that scrub is so gentle and a full size bottle lasts for so long! I use it maybe once a week (I use my Clarisonic once a week too) and I find it's a good combination for my skin. I get skin flare ups too - but these really help keep it all at bay. The La Roche Posay Effaclar Duo is a must when I breakout, but I totally want to try Dermalogica daily microfoliant! I know, I can't enough of the exfoliate either! I'm really impressed with it too, I will have to get the full sized bottle when I run out. Have not used any of these products, but that La Roche product is having such a rave at the moment. I hear so many good things about it! i quite enjoy the effaclar just because it is so gentle. it doesn't dry out my skin and works well enough given time. 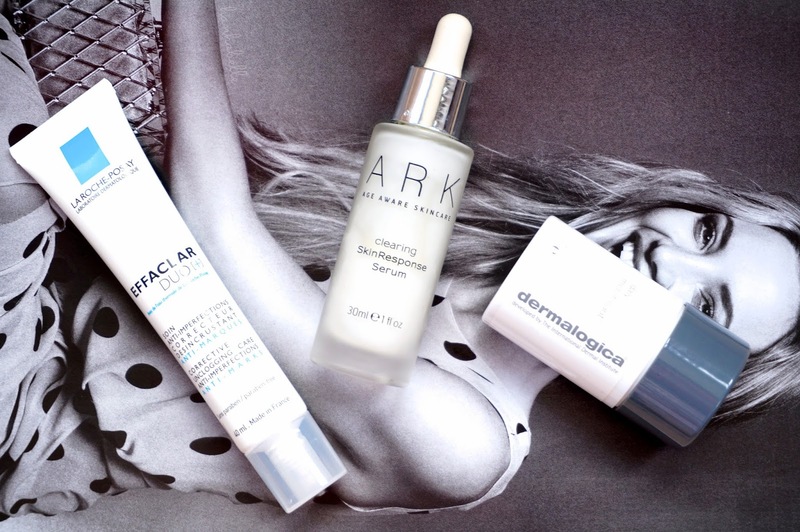 i haven't tried any of the others but the exfoliator from Dermatologica looks really promising! I love that Dermalogica exfoliating powder. It really does smell reminiscent of rice :) I use it about once a week or every other week to "reset" my skin. Diptyque just came out (or is coming out soon?) with a "powder cleanser" with kind of the same concept, so I'm interested to see how that turns out! It really does do the trick for when my skin is playing up! I think if used sparingly it really does give great results. Skincare is becoming more and more scientific these days! I'm really glad i've discovered this dermalogica exfoliant, i need to invest in the full size bottle soon! Great post, i love the effaclar duo+! I love Effaclar Duo+, it has majorly changed my skin for the best! I have an exfoliator mask from Dermalogica and love it as well, it really reduces the appearance of pores and blackheads. The rice powder sounds great too! I want to try out more from the Dermalogica brand as their micro exfoliant works wonders!